Whether you’ve read this blog for a while or if this is your first time here (welcome! ), you’ll notice that most of what I write about is food – food for nourishment, fuel, healing, connection and community. The past two weeks have been a bit of a whirlwind (hence my brief hiatus) but have reminded me that there’s more to being well than food. Although what we eat matters, other lifestyle habits can significantly impact our health and wellbeing, the quality and happiness of our lives, and even how long we live. 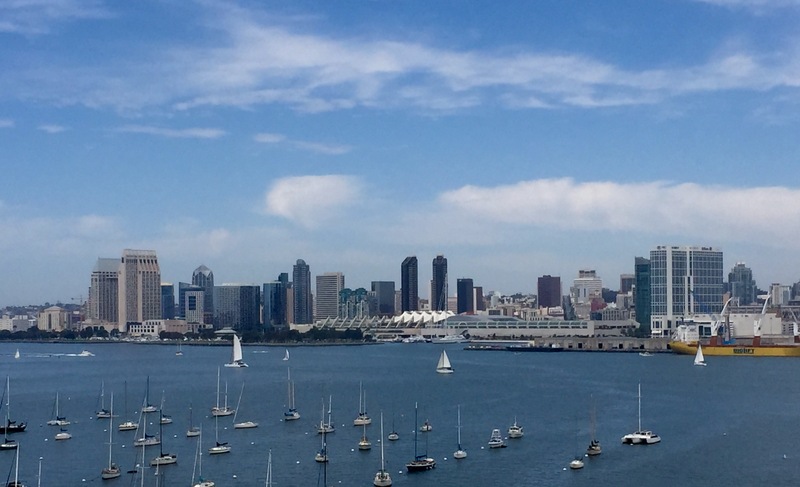 I recently spent 11 days in San Diego to attend two wellness conferences and relax with a much-needed vacation with my husband, Bill, to celebrate what has been the most exciting year in my career. During the conference, I was honored by the Wellness Council of America and had the privilege of meeting and spending time with some remarkable people in the field of health promotion. The second to last day of the conference, as my husband was preparing to fly across the country to join me, he called to tell me that his great-grandmother, Anna “Loucene” Trueworthy, had passed away at the age of 106. 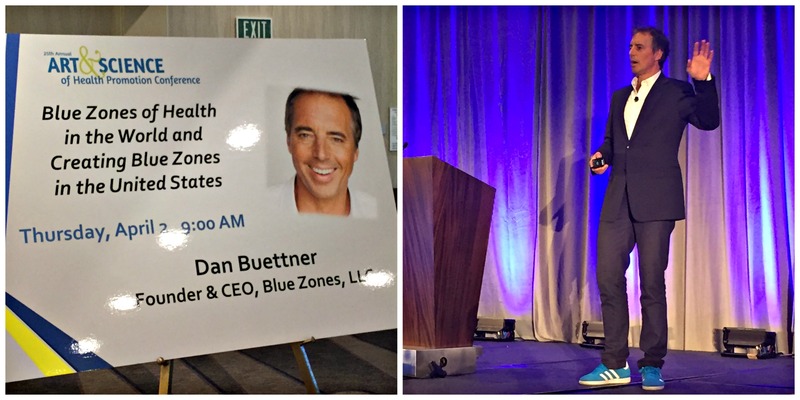 It was a bit ironic yet poignant that the topic of the conference keynote that morning was Blue Zones of Health by Dan Buettner, a man who has studied the lives of the longest lived people in the world to learn their secrets of longevity. Dan is the author of the books Thrive, The Blue Zone Solution and The Blue Zones: 9 Lessons for Living Longer from the People Who’ve Lived the Longest. 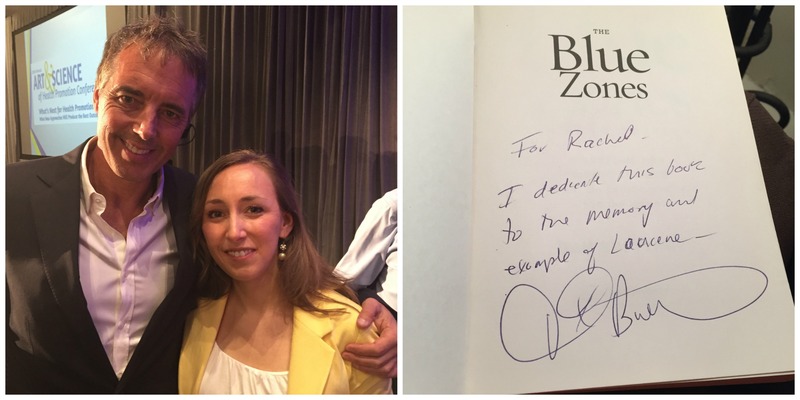 Dan shared what he learned in his research as he traveled around the world, spending time with and studying the lifestyle habits of people living in “Blue Zones,” regions around the world with the greatest concentrations of centenarians – people who live to be 100+. In his talk, he shared the lessons to a long life, and while diet was one of the key components, he and his team found that other factors impact a person’s longevity with genetics accounting for about 20%, as established by the Danish Twin Study. Without even knowing it, Great Grandma was a living example of many of the Blue Zones lessons. I wanted to take a moment to honor Great Grandma’s legacy and highlight just a few of the ways she lived out these lessons. For a full list of the Blue Zones “Power 9” longevity lessons, click here. Great Grandma didn’t spend hours at the gym. She didn’t have to. Much of her day was filled with natural movement – from doing chores, gardening, and taking after-dinner walks with her husband to square dancing and line dancing into her 80s, she moved naturally and enjoyed it. For people living in Blue Zones, being active without having to think about it was found to be a key to longevity. So many of us try to force activity and do things we don’t enjoy. Find ways of moving that make your body feel good and make you happy and incorporate them into your daily life. This one might sound a little bit strange, but it is taken from the Japanese and means we should eat until we are 80% full or no longer hungry. Many of us eat until we are “stuffed” and fall completely out of touch with our body’s hunger signals. As her granddaughter Susan shared during the eulogy, Great Grandma lived a life of moderation, never to excess. She was “the master of portion control” and never counted calories or fussed over what she ate, and unlike many of us today, she was never “on a diet.” She cooked a full meal every night for dinner, and the family ate together. We can all learn something from her example of listening to your body and eating to live rather than living to eat. Great Grandma had a reason to wake up in the morning. She lived on the family farm and lived independently in a small cottage until just a few years ago when she went to live next door with her daughter. Whether her purpose was to spend time with her children, grandchildren, great-grandchildren or even great great grandchildren, she had a reason to live. She was also an organist and in the bell choir at her church and played piano for the Yankee Doodle Entertainers until she turned 100. She found joy in socializing, music, reading, and needlework. A sense of purpose is one of the keys to living a long time. Taking time to relieve stress was another lesson Dan shared with us. 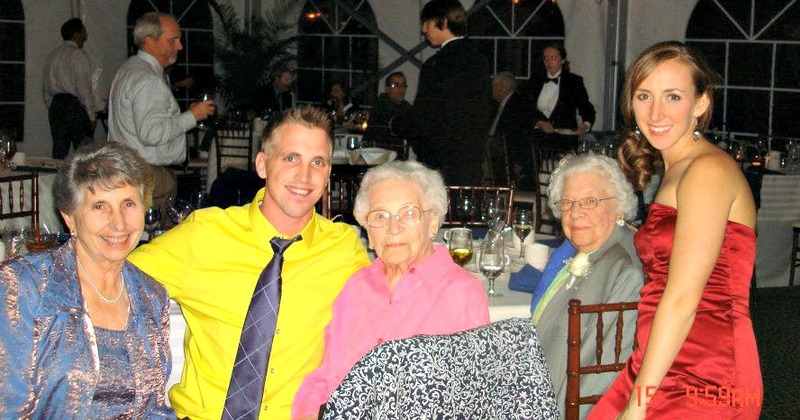 During her eulogy, Loucene’s son John commented how Great Grandma was never stressed. I would imagine she felt stress at times, as all of us do, but she knew how to handle and contain it in such a way that it didn’t impact her negatively. She spent time with family and her church community on a regular basis and found music to be relaxing as well. She was described by many as a devoted woman of faith, and her connection to God and her church also served as buffers to stress. My mother-in-law told me that Great Grandma and the rest of the family observed Sunday as a day of rest and set it aside for family time and a big family meal each Sunday afternoon. 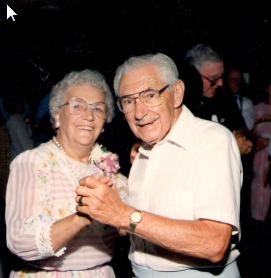 Centenarians take time to slow down, reflect and downshift their lives and Great Grandma knew how to do that, too. Great Grandma celebrating her 50th wedding anniversary. She was very social and set aside time to unwind and celebrate. Healthy centenarians have faith and are involved in serving and socializing with a spiritual community. Loucene’s granddaughter described the church as “the center of Great Grandma’s life.” She was involved in the Women’s Society, and she was a church organist and in the bell choir until age 100. She and her husband participated in the Couples Club, so the church was the center of her social life as well. The sense of belonging, purpose and connection that comes from being part of a spiritual community is one of the Blue Zones Power 9 keys to longevity. The most successful centenarians put their families first. Great Grandma never missed a birthday and sent a card for all major holidays, which was no small feat considering she has two children, 9 grandchildren, 17 great-grandchildren and 5 great-great-grandchildren. Her great grandchildren described her as admirable, talented, honest, witty, resilient, unifying, encouraging, wise, gentle, warm, welcoming, and classy. Great Grandma Loucene in the front row in the white with her younger sister, Eva, to her right in green, and her daughter, Cynthia, to her left in blue. 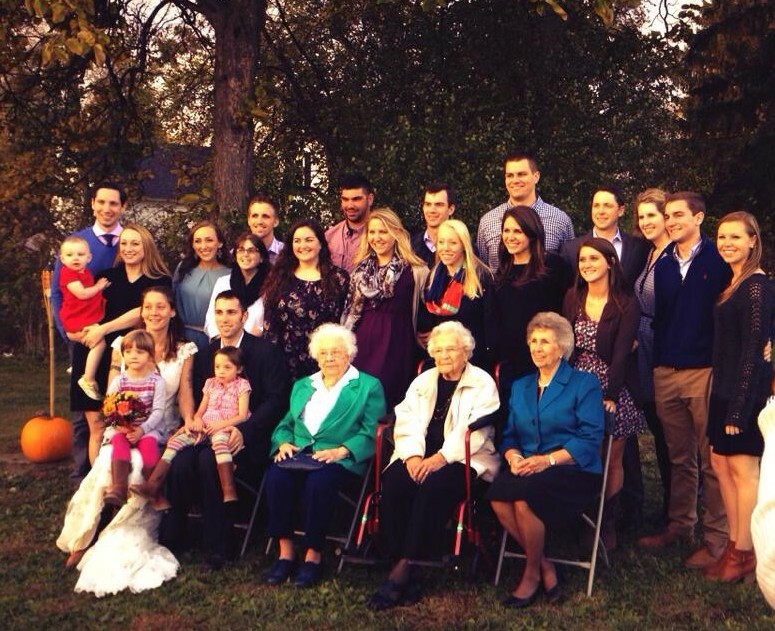 Her great and great-great-grandchildren surround her. She embraced technology and Skyped with one great-granddaughter in Haiti, another great-grandson in the Middle East and her first great-great-grandchild in New York City. She lived independently with her daughter, Cynthia, until the last few weeks of her life when outside care was brought in to help. In a society where caring for aging relatives is often seen as a burden, her family revered her and rallied around her to support and take care of her. During her memorial service, the pastor pointed out how Loucene’s life is an example to all of us of how to live fully. I feel blessed to have married into her family and to have had the privilege of knowing such a remarkable woman, who I’ve learned more about in her passing than I knew and appreciated while she was here. As I listened to everyone share their stories and memories, I reflected on how much Great Grandma lived the Blue Zones lessons – from living a joyful, simple, purposeful life of moderation and low stress, to belonging to and serving her religious community, socializing, and putting family first. The example of her life will continue to impact and influence the lives of all of the generations that follow her. Here’s to Great Grandma and the love and inspiring legacy she’s left behind. Absolutely beautiful Rachel! Very well-written. Thank you so much! I feel honored to share her story. Such an incredible life she led! What a great post! Older ones have so much life experience and wisdom to share with the rest of us. We can learn a lot from them!